Watson Lab Picnic in Riverside Park, which is only half a block from Watson Lab. 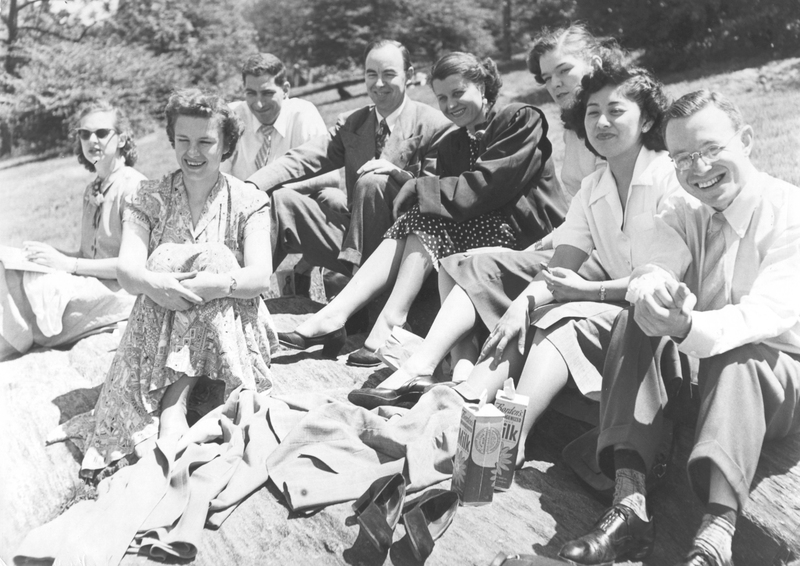 Left to right (with Watson Lab employment dates): Unknown person, Ann Franklin Beach (1947-54, who co-authored some of the Watson Lab bibliographies), David Mace (1950-59, who wrote the IBM 650 programming pamphlet ), Leslie A. (Let) Harlow (1946-55, electronic technician who built many of the chassis for the IBM 610 prototypes), Ursula Van Dyke Nornabell (receptionist and switchboard, 1947-53), Jane Lace Kolb (1952-60), Jean Ito Kariya (1947-54), and Eric Hankam (1946-59). The date of the photo is between 1952 and 54. Photo from the collection of Eric Hankam. Click on image to magnify to full size. Updated: Fri Apr 17 14:01:06 2009; thanks to Jack Palmer  for the identification of Let Harlow.